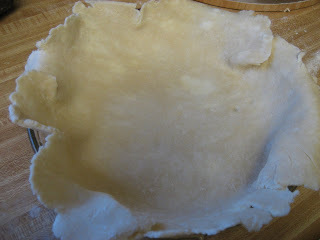 All Butter Pie Dough Crust...Years ago, my teaching assistant gave me this recipe for pie crust dough. I tried the recipe and absolutely loved it... loved the fact that it was flaky and tasty.The recipe is actually adapted from Melinda Lee, food news radio host, who called this recipe "foolproof". I have to admit I rarely use any other dough to make pies. 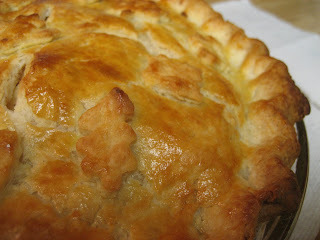 This recipe makes enough dough for 2 double crust pies and a bit for decorating! That means that you can freeze one for later. Of course you can halve it and just make one double crust pie if you like. Vanilla sugar, lemon/orange peel, almond flavor, are a few flavors you can add to the dough depending on the filling you use. The dough needs to be chilled before rolling out. You can handle the dough as much as you like, just don't overdo it. You should be able to still see some butter pieces through the dough. 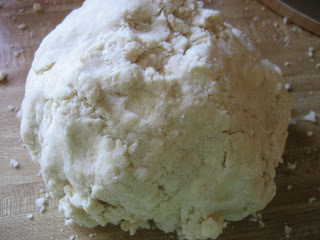 If the dough is too dry, add a 1/2 TBS of water to bring it together. You shouldn't add too much water. It is best if you just place the dough in the fridge to rest for 30 minutes or so. 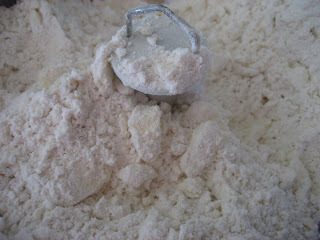 This allows the flour to absorb the liquid and in turn be pliable enough to roll out. 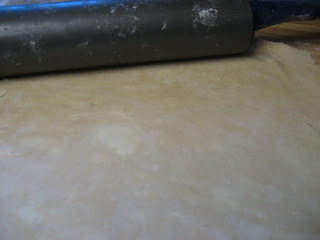 You can flour your counter top well to ensure that the dough won't stick as you roll it out. You will need: add flavoring amounts as you like or skip all together. 1. 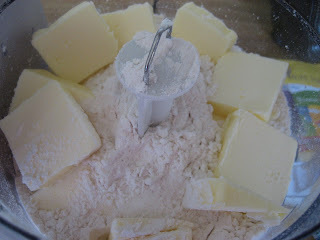 Mix first 4 ingredients together with a fork or pastry blender. I have,of lately, started to use my food processor for this... pulsing it until the butter pieces are a bit bigger than peas, more like kidney beans. 2. In separate bowl, beat remaining ingredients. 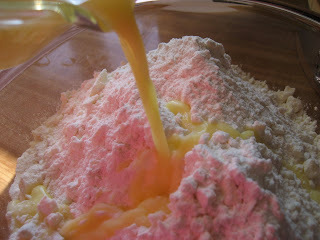 3.Combine the 2 mixtures, stirring with a fork until all ingredients are moistened. 4. 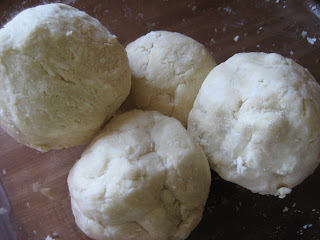 Then, with hands, mold dough into a ball. 5. Chill at least 20 minutes, before rolling it into desired shape. 6. Divide the dough into 4 equal parts.This way, you know you have enough dough for 2 double crust pies. If you like to freeze some, make sure you wrap the dough well before freezing. 7. Roll the dough out. You can see, in the picture above, some white pieces of butter in the dough. This will make it flaky. 8. 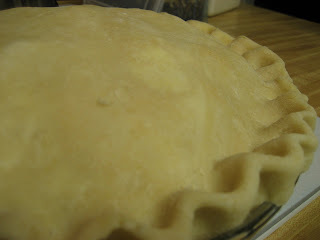 Make sure you leave about 1/2-1 inch overhang of pie dough so you can seal the bottom crust with the top crust. 9. Fill with desired filling. 10. 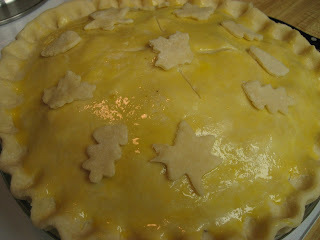 Place top crust, crimp and glaze with egg wash.
11. Bake in a preheated 400-425 deg.F oven. Make sure you cover (tent) the pie with some foil half way through(or when it is just golden...it will continue to lightly brown even with the foil on) so that the dough won't burn. My entire family has this weird thing for pie. Next time we all get together, I'm definitely using this crust recipe. Looks delicious! Kimberly Joy, Thanks for stopping by. I hope you have fun making some delicious pies!